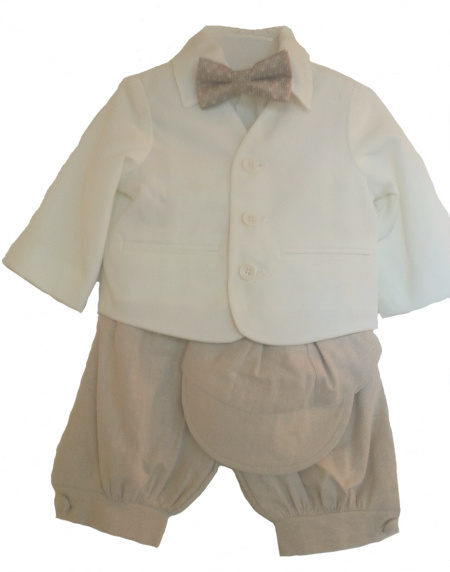 DapperLads - *Exclusive* Eton Ivory Jacket With Sandstone Tan Knickerbockers - Knickerbockers - US made Victorian fashion boys knickerbockers sets with genteel nostalgic appeal. A DapperLads Design Original - The Victorian era English school eton jacket in ivory is paired with our sandstone tan knickerbockers and a khaki patterned bow tie. The suit includes a newsboy cap and that matches the knickers and a white long sleeve shirt.